You know that old saying: if you're going to live life like a fairy tale, you might as well live it like the biggest tale there is! Okay, maybe that's not a real saying, but it's still true, and in the world of fairy tale characters, you can't get any bigger than Snow White. 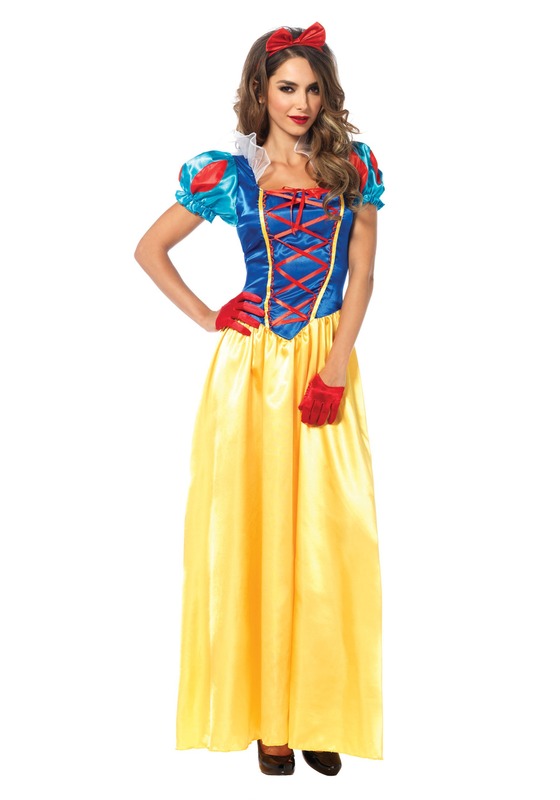 Show up to a costume party in this beautiful Classic Snow White Costume, and you'll have the look of a true storybook princess! Even before a magic mirror let slip that Snow White was the fairest one of all, it was probably a safe bet that she was at least in the Top 10. Besides having elegant and classic beauty, Snow is also quite the charmer. But, if this lovable lady had one flaw, it's how she could be a little too trusting at times. Sure, she lucked out when the dwarfs who owned the forest cottage she stumbled into happened to fall in love with her, but it could have easily gone another way if that had been the home to seven hungry goblins, instead! And as far as accepting apples from mysterious strangers goes, well... we all know how that ended. But that's just the price that comes with being on the fairy tale A-list, and when you're dancing in this glamorous costume, you'll quickly see that it's totally worth it! The shimmering satin gown is officially licensed, and designed to replicate Snow's iconic Disney look, so you just need to add some lovely slippers and an optional Snow White wig to complete this magical look! And keep an eye out for old crones handing out fruit... just trust us.